People have a rhinoplasty for several reasons. It might be to improve breathing, or to correct damage caused by an injury to the nose. 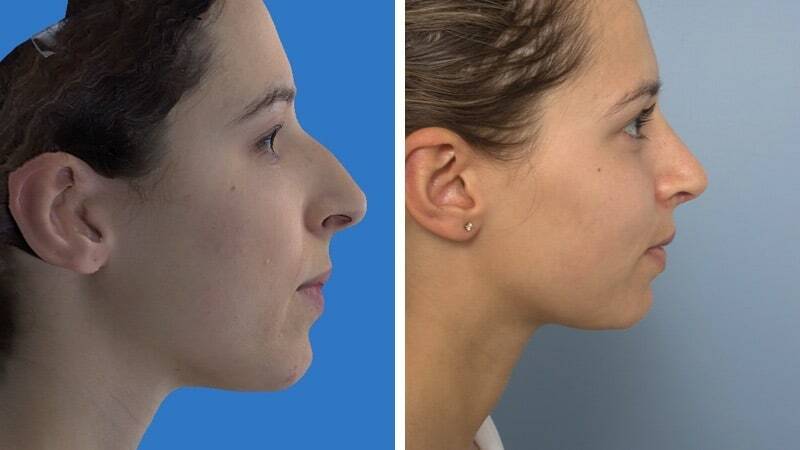 Many people are unhappy with the shape of their nose, and want to improve it. After a rhinoplasty, a proportion of people consider a further rhinoplasty procedure. This is called revision rhinoplasty. 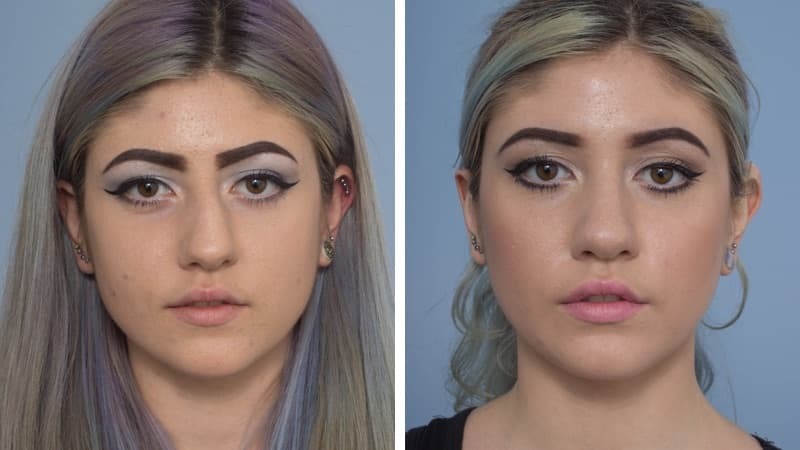 Why do people consider revision rhinoplasty? Essentially, because they are not satisfied with their rhinoplasty. Either there is a small but important issue – or the entire nose is felt to be unsatisfactory. People who have had a rhinoplasty and seek revision are often distressed by their result. They may be concerned about shape, asymmetry, breathing issues, or a particular negative effect of the initial rhinoplasty such as an inverted V appearance. Sometimes they feel that their new nose is not what they thought they were getting. In some people, the result might be objectively good, but they have unreasonable expectations and wanted “more” from their rhinoplasty. 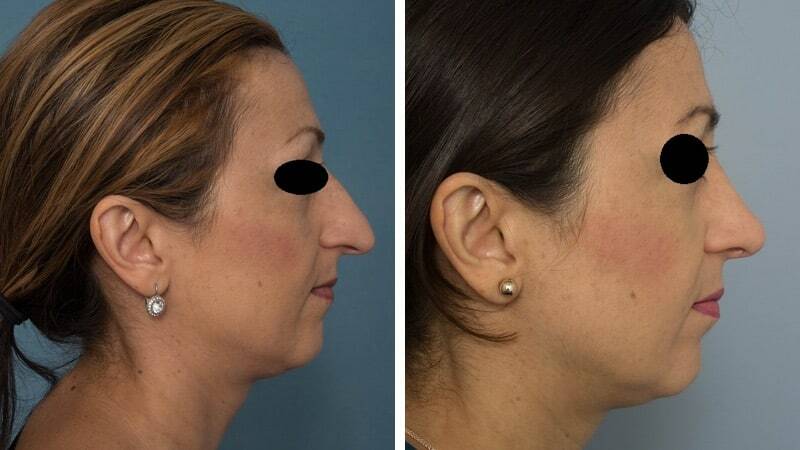 Why is revision rhinoplasty sometimes necessary? Rhinoplasty is difficult and precise surgery, which deals with sometimes unfriendly tissues – for example weak cartilage, crooked tissues, or thick skin. Healing problems can occur, such as grafts warping. This is not always the fault of the surgeon, and no surgeon can always get it right. If a surgeon says to you that they never have a patient need a revision, they are not telling you the truth. Please read my extended essay “On Rhinoplasty”. I have tried to give you some insight into the difficulties of rhinoplasty surgery that are faced by both surgeons and patients. I have a view that rhinoplasty surgery is generally not well discussed between patients and surgeons, and a deeper level of insight, if it can be attained, will help patients and surgeons make better decisions when discussing a possible rhinoplasty. There is no doubt that very expert and experienced rhinoplasty surgeons achieve better and more consistent results, but we have all had our own patients come to us requesting a revisional procedure for a problem they perceive or have developed. You should expect that an expert rhinoplasty surgeon would have a low number of patients who end up needing a major or total revision. The occasional rhinoplasty surgeon may be better not doing the procedure at all. It’s not for part-timers. Why is revision rhinoplasty so difficult, you may ask? Can’t we just change a little bit here and there? The nose is a delicate structure, with a lining of thin soft skin. There is a thin skeleton made of bone and cartilage, with mobile skin and muscles on the outside. During a rhinoplasty, septal cartilage is often removed. Bone and cartilage from the skeleton are removed and moved around. All the layers heal by gluing together with scar tissue. The original nose is gone, and it can’t be brought back. Often, most of the usable or structural cartilage has been taken out. We have to start with what we have left and plan how to make the improvements we are seeking. Minor revisions – addressing one part of the nose, when most of it is pleasing and fine, is usually reasonably straightforward. A major revision on the other hand, is more complex than the initial rhinoplasty and sometimes far more complex. The patient may be distressed about their nose, and about their previous rhinoplasty experience. The success of the surgery depends on a number of factors. While the surgical plan can usually be carried out, not all aspects of revision rhinoplasty are predictable. We want the long term result to be a good nose which has met the shape and function goals we set before surgery, and with which you are pleased. Excessive scar formation can result in shape problems. Cartilage can warp leading to asymmetry, which may require improvement. If asymmetry is present before the operation, it may not be fully correctable. Surgery to the nasal bones may leave small bumps or irregularities upon healing. 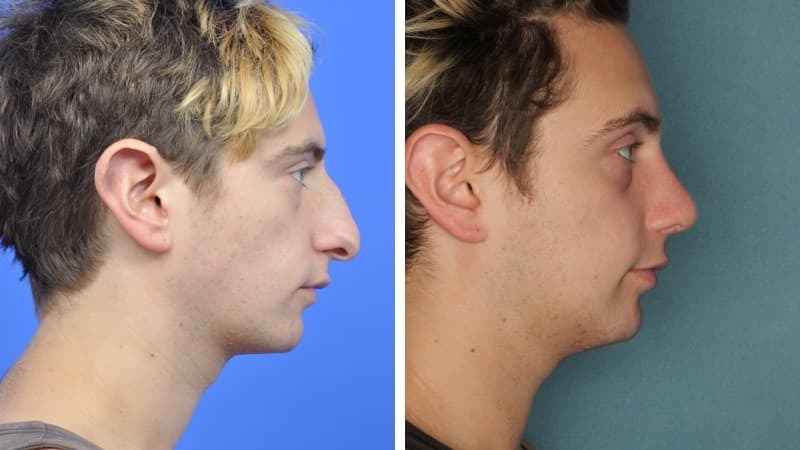 Due to these factors, a proportion of revision rhinoplasties themselves require further revision, or a second smaller operation, to achieve the best possible result. 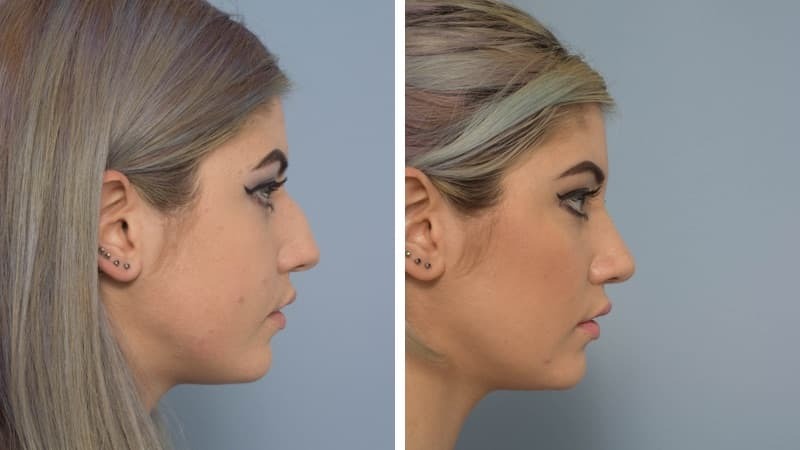 Things to consider before revision rhinoplasty? Generally, I will want you to wait a year after the first rhinoplasty before considering a revision, as the original swelling can take this long to go down and the skin regain its mobility. Sometimes, the nose can be swollen for much longer than a year. It can take this long for the skin to become looser and mobile again. A careful diagnosis of the problems must be agreed upon by the surgeon and the patient, and a good plan must be made. The extent of the revision procedure will depend upon the problems we are presented with. Usually more than one consultation will be needed. We want to get this right. If the original rhinoplasty was mostly successful, but there are small, specific problems with it – for example a residual dorsal bump or a hanging columella – the revision will be a small procedure, without a great deal of recovery or the risk of an unpredictable outcome. This is not a total revision. Conceptually, it refines an already reasonable result. If the revision plan is to make major changes, it will mean that the revision is actually a bigger operation than the first rhinoplasty. It can take longer, and from the surgeon’s perspective, it is more demanding. There is always the risk that the revision does not solve all the problems it has tried to solve. Many revision rhinoplasties require cartilage grafts, to create both stability and restore shape. If there is enough septal cartilage left, this is usually the first choice. Usually, there isn’t. If there isn’t enough left for a donor graft, the cartilage may be taken from the bowl of the ear (conchal cartilage graft), or from a rib (costal graft). Very occasionally, bone graft might be needed. Conchal graft is thin and soft, and is a good material to use for covering a defect, or for adding cartilage to a tip where too much was removed. It isn’t strong though, and is not optimal where strength and structural support is needed. Rib graft is strong and there’s a large supply of it. It’s the best material for rebuilding the structural support of a nose where septal cartilage is not available. Some things can’t be changed, and it’s not always possible to achieve everything the patient desires. It is vital for the patient and surgeon to understand and agree upon the aims of the operation, before it takes place. Well-informed patients, good communication and clear surgical plans are the key to success. The surgery is almost always performed as an open rhinoplasty, under a general anaesthetic. Once the skin is lifted from the skeleton (the bone and cartilage), I perform a series of planned tasks designed to alter the shape of the nose, and when necessary, to improve crookedness and try to improve the airway. The operation may include some, or even most of the following techniques. Movement of the sidewalls of the nose (in or outfracture). Cartilage grafting – spreader grafts, tip grafts, dorsal grafts, columellar grafts, rim grafts, batten grafts, diced grafts. The operation is open-ended in terms of time, and is finished when the shape of the nose is complete and strong. As I write this in early July 2017, I have done four complex revision rhinoplasties in the last 12 days. Two of these used rib cartilage, and two used ear cartilage for graft material. Each procedure took over four hours, with one taking five and a half hours. That’s the world of revision rhinoplasty. An external splint is placed on the nose at the end of the operation, and sometimes internal splints or packs are used on the inside. An absorbent gauze or bolster is placed under the nose, as it often bleeds a little for a few hours postoperatively, or even for a day or two. There will be an external splint on the nose for five to ten days after the surgery. Small amounts of fluid drain from the nose. Gauze is used to absorb this fluid. Medication is given to limit any pain and nausea. You will usually stay in hospital overnight. Discomfort on the first day is expected, but it is generally not severe and decreases quickly. At home, set yourself up in a comfortable chair, couch or bed, with your head elevated. If bleeding occurs after surgery it may be controlled by sitting quietly with ice packs on your cheeks. If it is persistent or severe, it may require nasal packing and you should contact me immediately if this is the case. This is rare. Facial bruising is normal after rhinoplasty. While the extent of bruising will vary for each person, it usually fades within 14 days. Around two weeks off work is usually enough, but it depends on your occupation. Heavy exercise should be avoided for four weeks after surgery. Bending, stooping or heavy lifting may cause postoperative bleeding. You will see a noticeable change even through the splint and tapes. The nose will look different immediately after the surgery. Whilst some of the swelling will disappear within three months, the actual healing process and resolution of swelling takes a full year and sometimes much longer. Some sensation of the nasal skin is reduced, which may feel disconcerting for a while. Patience is needed as it will take time to see the final result. With revision rhinoplasty, it is quite common to see some long-term reddening of the nasal skin, with visible broken veins.